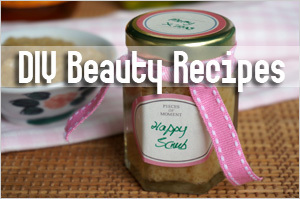 Sometime ago, Jyoan of Positively Nice mentioned in one of her comments that she’s been drinking Apple Cider Vinegar as a beauty aid three times a day. I understand that Apple Cider Vinegar can help to create a more alkaline pH in our body and hence, is great for detox as well as slimming. We bought a bottle back then but because of the funky smell, I haven’t been able to bring myself to even take a sip. My husband drank most of it and he said he quite like how he felt afterwards but because we started taking the Fit Solution all-in-one complete supplement, he hadn’t gone back to drinking it anymore. I still have some of it left in the fridge and have been using it for my hair and acne instead. Apple cider vinegar can help to balance the pH of our hair and remove the buildup from using silicone-based shampoos and conditioners. What I do is I saturate a cotton wool full of undiluted apple cider vinegar and dab it to my scalp after washing my hair. It is actually best not to rinse out but the smell is unbearable even though it does dissipate after some time. So I usually just let it sit for about 10 minutes before rinsing off. I can’t say that I’ve grown more hair but I do like how my hair looks and feels afterwards – more volume and looks kind of glossy. But the smell is really too much for my liking. Apart from being able to regulate the pH level of our skin, Apple Cider Vinegar is said to be rich in alpha-hydroxy acids and hence, is great as a natural skin exfoliator. I’ve tried applying ACV neat on some of my acne spots and it does help to reduce the redness and inflammation for some of them. I know some use ACV as a toner, diluted either with mineral water or green tea but personally, I’m not keen to use it so often as it can irritate the skin. So I would recommend this as a spot treatment for blemishes. 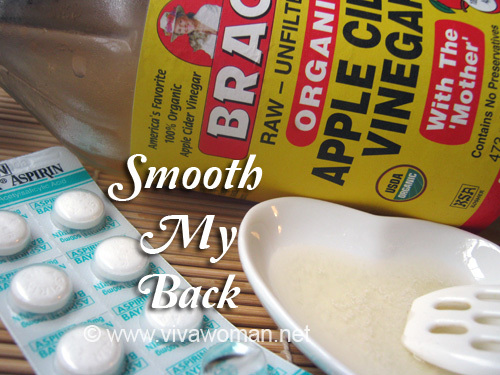 Â I read that ACV is great for those suffering from back acne! Apple Cider Vinegar has a host of other health benefits when ingested. Besides providing detox and slimming benefits, it contains beta-carotene, which help to counteract damage caused by free radicals and also potassium, and that is good for fighting common colds and allergies. 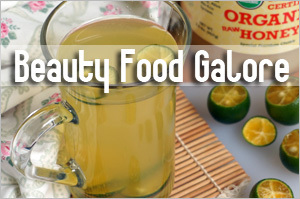 I believe that with long term consumption, this ingredient can help improve one’s health and beauty. That is, if one can take to the smell and taste. Erm…any of you loving Apple Cider Vinegar? 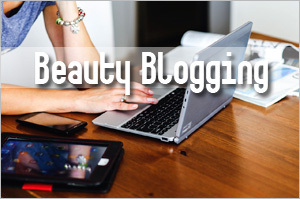 Previous Post: « Share: must your beauty products smell good? I used to dilute the solution with water and add some honey. Unfortunately I don’t see visible results after drinking for 2 months. The smell filled up the cabinet and drove my mum into a fit. Literally. 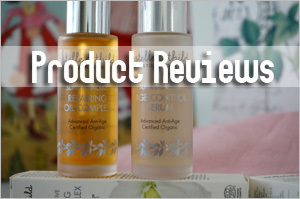 I’ve also tried it as a toner but also not much difference. I think the key is in the brand that I’d purchased. Don’t remember the name but it’s one of the cheapest in the market. Might be the brand. The one recommended is Bragg. I think as a toner, it might help those with unbalanced pH so if yours is fairly normal, then you won’t see much difference. 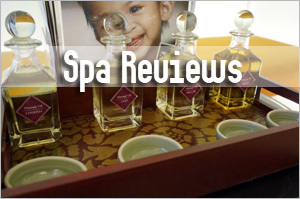 Braggs is the recomended brand and it is about $10 a bottle in Singapore. I was unable to take it straight as it burnt my throat. However, i do know of some people who is able to do that. I did not see any effects after drinking 1x a day. I stopped as I was worried about the effects on my tooth enamel. Can take it neat? I only know about diluting with water. It’s also best to use a straw to drink it to prevent problems with your teeth. 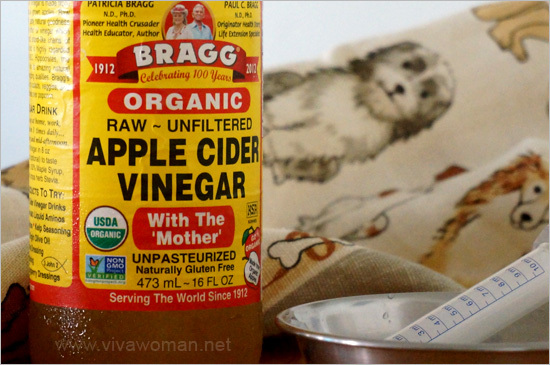 My family has been taking Bragg’s ACV for years. My dad swears by it in preventing gout. My brother only drinks it when he has a gout attack, but it works for him then. I try to remember to drink one glass of it (1 tablespoon diluted in one glass) but I often forget. But never ever try to drink ACV neat – it’s so highly acidic that it can eat away your teeth’s enamel. 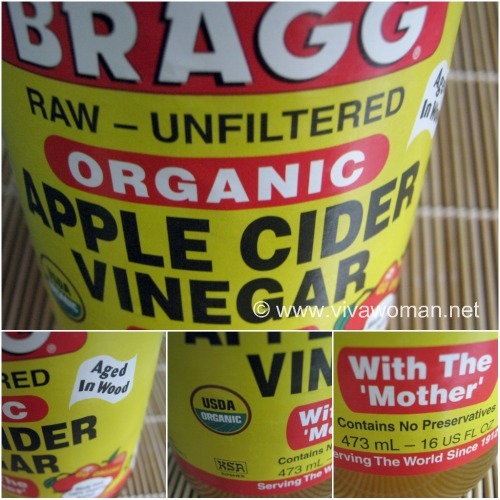 When he was suffering from hip pain, several friends recommended the ACV, so my husband started drinking a tablespoon of this in a cup of water. He said it tastes worse than salad dressing! It’s not the brand you’ve pictured there, but it is organic and pricey, just less than the other one. I just looked at it in the cupboard and I have to ask husband if he actually drank that much (all but 3-4 inches), or if it evaporated. Whatever, it is slated to be made into salad. dressing! The pain was bad enough that he was considering getting a cortisone shot. He was also taking astaxanthan, a supplement based on microalgae which is supposed to be antioxidant and anti-inflammatory. Well, we don’t know whether one or the other worked, or if it was both, but after about 6 weeks – no pain at all! That’s amazing…I’m sure that the ACV has something to do with removing his pain. I using as a final rinse for my hair but everytime I use it,my boys will complaint…..mummy your hair stink!!! The smell is unbearable. I notice that it sometimes lingers on. For the last 3 years all I’ve used for “product” in my hair is baking soda and water to wash it and ACV to rinse it. I dilute the ACV 2-3 tbs in 16 oz (2 cups) of water. (I have VERY long hair – it’s thigh-length). I wash with the BS and water, rinse that out, rinse my hair with the ACV and water and then rinse that out. I never have any smell in my hair after rinsing and letting it dry. There’s really only a minimal smell when it’s drying. Once dry, there’s no smell even in the humidity of Georgia (in southeastern USA, nor is there a smell if I sweat or get caught in the rain. I think the trick is that I rinse the ACV/water mixture out of my hair. i used it as a lotion mask before every night. 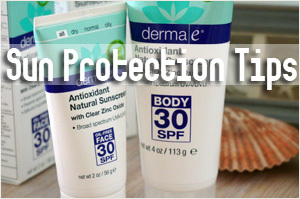 it work well for my acne as well as acne scars. but this kind of thing has to be maintained because if you stop for some time, everything comes back again. As a lotion mask? I’ve never realized that’s possible. Very interesting! I’ve heard from hundreds of people who swear that apple cider vinegar (or cider vinegar – same thing) does wonders for their skin, even if they don’t have an acne problem. The ACV tonic (one teaspoon to one tablespoon of apple cider vinegar in a tall glass of water) can be taken up to three times a day with meals and will improve your nutrition, hydration, and the processing of all those excess oils in your body that result in acne. 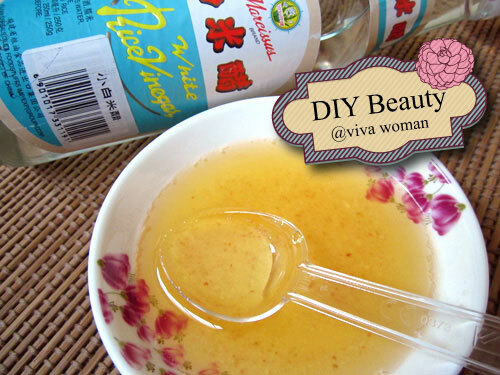 A diluted ACV wash can also be great for the skin. Try it fifty/fifty with water to restore your skin to the acidic condition your skin prefers and kill off acne-causing bacteria. Thank you for sharing your thoughts on this one. Using a diluted ACV wash sounds quite good for those with pH imbalance issues. Emphasis on the use of ORGANIC vinegar for maximum benefit. Yup, agree. I also think organic ACV is the best. I’ve come across that recommendation of adding honey but not tried it. Still can’t bring myself to drink it. My friend’s father swear by the apple cider vinegar remedy for his back acne/rash that comes up once in a while. So it does work for some people. Oh it works for body rash? Wow… I didn’t try that for mine when I had it awhile back. Our family had a bottle of this a couple of years back… that we took eons and eons to finish it (the smell!). But after reading through the comments like toner mask, mixed with honey and as a diluted wash, I think I’ll get a bottle again to give it a try. *raises hand* I am a believer 🙂 I have been using ACV Toner since over 1/2 year by now. 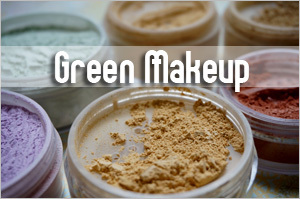 Mine is diluted with a strong green tea I make in a espresso can I add some EOs fitting for my combination skin. My skin is soooo smooth I can’t believe it! I am surprised each day. My bad acne I had is completely gone! My skintone is very even too. ACV is seriously my HG toner. 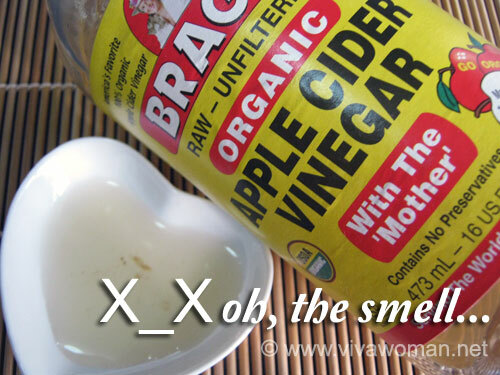 All the store-toners you get don’t even get close to ACV. I think its important to find the right amount of dilution for yourself to make it work. I try to make it a 1:8 ratio ACV .. so 1 part ACV and 8 parts green tea. I can recommend 🙂 I only use it once a day though. I was suffering from a chest pain two weeks ago and I had no insurance at all to go the hospital. I was worried about my health situation. Then, I was thinking about the herbals or any other kind of natural medecine that could have helped me out. I went on this website and I read about the ACV.I bought a bottle. I started using every morning and it works perfectly. I feel no more pain and fatigue.Now, I am stronger than ever. Oh that’s so great! I didn’t know ACV can even help with chest pain. That’s wonderful to know! I Lurve ACV. I use Bragg’s because it is raw. That means that the beneficial micro-organisms are intact, which does good things apparently. I believe it helped me lose 45 pounds this year. (I also stopped eating gluten, but didn’t lose that much until I started the vinegar.) I just do a teaspoon in a big glass of water, along with some buffered vitamin C crystals mixed in. It tastes good to me! I’m about to try it as a toner too. I started an infusion of calendula flowers in some ACV a few weeks ago and will add that to some aloe juice, glycerine and rosewater. I’ll let you know how that goes! Wow, 45 pounds??? That’s amazing! I haven’t got down to trying it out as a toner but will want to do so. But I really cannot bring myself to drink, even if it’s just one teaspoon. But you’re right that it has beneficial micro-organisms! Me and my sister swear by ACV for toner! We, sisters of 3, are pretty much blessed with a decent skin. However, we suffer now and then of back acne when stress or hormonal condition surfaces. We hate the smell at first. It was just too crazy, even now when we can’t live without this. But the result is almost instant! Zits dried up overnight and dark spots left are diminishing. We have to literally fume the bathroom with lavender spray afterwards tho. And sadly, it only helps a little. But beside of the zits problem, we believe this somehow improves our skin. Less oil problem, more glow. I make a 1:1 ACV and greentea and put a cinnamon stick inside the bottle for added antioxidant and anti-inflamation effect. I must give the ACV greentea toner a try soon. Adding the cinnamon stick sounds like an interesting idea! I use a Water/ACV/Honey/Tea Tree EO rinse to prevent dandruff and dry itchy scalp. It works wonders. Oh interesting! Should get my hubby to try this if he’s willing. Almost all elements are proven to be effective on hair loss problem. But this things depends on you. 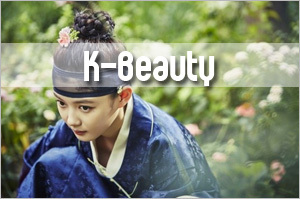 If you feel that this certain remedy has soothed your hair problems then it must be good for you. I used it a couple days ago, as being a teenager with hair loss is kind of embarrassing. I’ve just brushed my hair and saw no loose strands. I left it on my scalp along with cayenne pepper for three minutes and then followed along with my normal Pantene hair routine. 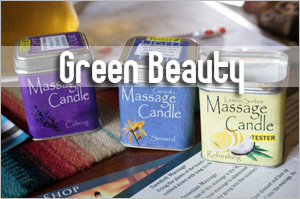 It restores the elasticity that’s been taken away by wear and tear from years of stress and chemicals. I guess it does well with eliminating the PH hormone on the scalp. 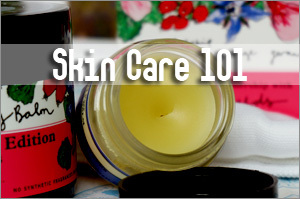 I’m a little hesitant to try acv on my face, being I have sensitive skin. Recently, I’ve used a honey and cinnamon mixture. Anyway, I came across after being happy with acv results. If you’re having hair loss, I’d say try it! Oh for hair loss? Hmm…may give it a try but I wonder if I can take the smell.